Clams, cockles, mussels, oysters, whelks, scallops and winkles - sounds like something out of a child’s storybook. What they all have in common is that they live in shells in the sea, but hard to put all under one umbrella as there are about 85,000 species of mollusc from around the world. These are the species that we know best although winkles and whelks are often overlooked, take a jaunt to France and you would find restaurants serving platters piled high with plump sea snails. For this recipe we are using the clam (sister to the Oyster and the Scallop – all three are bivalves), but you could quite easily substitute for the cockle or for mussels. If you are wanting to experiment with molluscs, The Fish Society do a very good online selection. Clams come in all shapes and sizes, you have beautiful French Verni or the small, meaty Vietnamese Surf clams, then there are the Venis clams that have creamy smooth shells, the cherrystone which are the largest and the carpetshell which are the smallest, and then there is the razor clams which are long and narrow with delicious sweet tasting flesh. We cook with clams frequently as they are the key feature in our favourite pasta dish – The Vongole, which is a simple spaghetti number with garlic, chili, white wine and parsley. Here we are cooking them in delicate broth which if you have time pick up some fish bones from the fishmongers and make your own stock, if not then pick pre-made fish stock (Ariake does very good bouillon sachets that you can just keep in the cupboard till needed). We happen to be serving this dish at an upcoming event, it will be part of an interactive station where you can have it with either spaghetti or homemade ricotta and saffron ravioli. 1. Soak your clams in fresh water for 20 minutes before cooking. 2. Heat a little butter or olive oil in a pan and add the leek, garlic, celery, bay leaves, fennel and chilli, give a good stir around and cook for a couple of minutes. Add the stock, sherry and saffron and simmer for 20 – 30 minutes. 3. Take off the heat, place a sieve over and bowl and drain. Discard the vegetables. 4. Pour the liquid back into the pan and add the lemon and then bit by bit whisk in the butter. 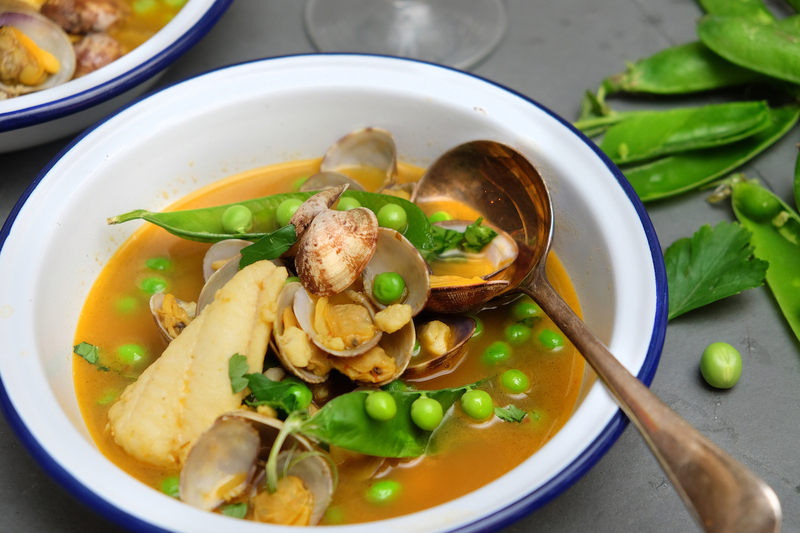 Bring back to the simmer and add the clams and cook for 5 minutes, add the lemon sole and the peas and cook for a further 2 minutes. Discard any shells that are not fully open. Serve into warmed bowls and sprinkle with parsley, and you want an nice hunk of bread and a glass of white wine with this.